We build iOS applications using both cutting-edge and time-proven technologies. Our goal is to create applications that Apple users will truly enjoy and use. We provide custom iOS app development for iPhone, iPad, and Apple Watch and use an omnichannel approach for the best user experience. We follow best practices of iOS application development and carefully select frameworks and libraries that best meet the goals of each app. Mobindustry uses advanced analytics tools and covers applications with unit tests to ensure the highest quality. Our iOS app developers also regularly refactor our iOS applications to make them maintainable. These are the architectural approaches we use to build iOS apps. An architecture is the base of every application, and it’s very important to choose the right architecture before development starts, as it will define the whole process from implementation through maintenance. Model-View-Presenter is a development architecture that divides the whole application into three layers: a data layer, a UI layer, and a presenter layer, which works as an intermediary between the data and UI layers and reacts to user input. An MVP architecture is generally used to build user interfaces, as it shows how the interface changes according to data and user behavior. Model-View-ViewModel divides an app into business logic with basic data, the UI, and a UI model that reflects all changes in the business logic. With MVVM, we enjoy all the possibilities of data binding, which allows us to completely separate the UI from code. This enables designers and developers to work separately and minimize the app’s logic. Clean Architecture usually distinguishes four layers: business logic, use cases, interface adapters, and frameworks. In reality there can be any number of layers, but they can’t be affected by each other according to hierarchy. Independence from frameworks and databases makes apps built with Clean Architecture maintainable and flexible. Allo is a big electronics retailer that owns over 250 physical shops around Ukraine. 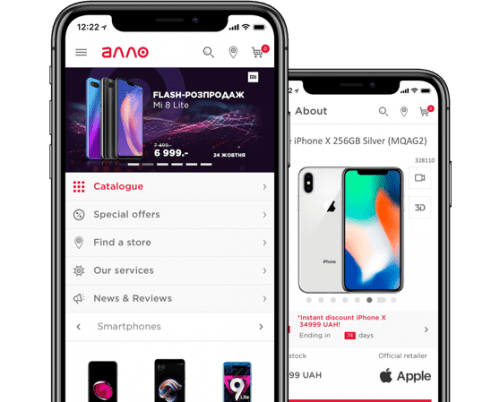 We developed an iOS retail application that has all the features necessary for making a purchase anytime and anywhere, including geolocation, a payment gateway, a catalog, product pages, and search with advanced filters. After the app’s launch our client noticed an increase in overall sales and revenue. This gave a big push to the app development process, and currently we’re maintaining the Allo iOS app and adding new features that optimize the delivery process. We frequently update our client’s app on the App Store, optimize its profile, and support users by responding to their requests.